A recent blog post on Sightline, an environmental blog in the Northwest, celebrated the gusher of dependable revenue to Washington State flowing from a steep carbon tax. The post showcases just why a carbon tax is a dangerous policy. As we at IER have been warning for years, the advocates of a carbon tax are fooling themselves if they think it will be calibrated to the “optimal” level reflecting the “negative externality” of greenhouse gas emissions. And in this debate the most foolish of all are the handful of vocal conservatives claiming that a new carbon tax will be used to cut other taxes. We have to wonder whether such pundits are actually reading what the environmentalists have in mind—with the blog post from Washington State being just a typical example. The activists have already spent the money, decades into the future; there are no plans for offsetting tax cuts. Is carbon revenue too flighty for Washington to depend on it to solve some of its budget woes—including the [Washington] State Supreme Court’s McCleary mandate to fully fund education? If a carbon price is successful at cutting pollution, won’t the revenue stream dry up as the pollution dwindles? The answer is no. Price and pollution are related; the price must progressively increase to continue curtailing pollution. 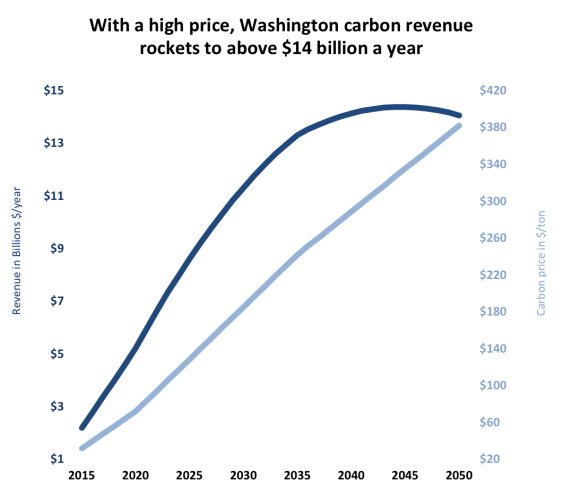 If Washington keeps ratcheting down the pollution, it will receive a carbon revenue stream that will steadily rise for the next two decades and then flatten out in the 2040s. …I offer three plausible price scenarios based on what we know…Each of the scenarios below assumes the Evergreen State hits its existing pollution abatement goals: getting back to 1990 levels of pollution by 2020, then cutting to 25 percent below 1990 levels by 2035, then slashing to 50 percent below 1990 levels by 2050. No, that’s not at all what she said. Rather, Eberhard wrote: “This scenario is the only one in which revenue tapers slightly in the final years…Washington could choose to continue de-carbonizing its economy even more after 2050 by pushing the price even higher. Doing so might result in a flat revenue stream.” In other words, Eberhard is trying to convince her readers to sign on for a carbon tax, because even if the revenue dries up prematurely, policymakers always have the option to jack up the rate of the tax in order to keep the dollars flowing in to state coffers. And what kind of a spoilsport wouldn’t want at least a king’s ransom in new revenue flowing to the state government? How else are they supposed to fix Washington’s “budget woes,” mentioned in Eberhard’s opening sentence? I hope Eberhard’s breezy analysis rattles the mainstream economists who have assumed matter-of-factly that a carbon tax is an “efficient” policy because it will fix the “market failure” caused by man-made climate change. No, this is not the case. Even on its own terms, installing a carbon tax is only “efficient” if the tax is set close to its “optimal” level, balancing the marginal cost of reducing economic growth a bit more against the marginal benefit of avoiding a little more climate change damage. Look again at the steepest carbon tax scenario above. That is a ridiculously high trajectory for the path of carbon taxes, far above the “social cost of carbon” estimates put out by the Obama Administration (and which are themselves dubious). The so-called “social cost of carbon” in theory measures the total damage from climate change due to the emission of an additional unit of carbon dioxide. Therefore, if the government enacts a carbon tax at a rate much higher than the social cost of carbon, it is punishing emissions far more than can be economically justified, even using the computer models that the Obama Administration chose for this task. To give a specific example of just how absurd the Washington State numbers are, consider that the May 2013 White House update (page 3) says that in 2050 the “social cost of carbon” will be $71/ton of carbon dioxide, using a 3% discount rate (which many take to be the benchmark). Compare that with Eberhard’s figure of $380/ton in her blue line above—and remember, she has no problem jacking it up even higher beyond 2050, if that’s what it takes to keep that revenue stream from falling. That means Eberhard’s high-end figure is more than five times as high as the benchmark estimate put out by the Obama Administration as to the appropriate penalty for carbon dioxide emissions. To get a sense of just how monumentally destructive this level of a carbon tax would be, consider the analysis of William Nordhaus in his “DICE” computer model—one of the models chosen by the Obama Administration to provide its own estimates for regulatory purposes. If you look at Table 5-4 (starting on page 92 here) from his book A Question of Balance, Nordhaus shows the associated carbon tax rate that would be necessary to hit various possible climate goals. We can work backwards, looking up Eberhard’s possible carbon tax for Washington State and seeing what the benefits and costs would be, according to Nordhaus’ model. But first we need to make a conversion: Eberhard seems to be quoting her figures as tons of carbon dioxide, whereas Nordhaus’ figures are quoted in tons of carbon. A ton of carbon is equivalent to about 3.67 tons of CO2. So if Eberhard in 2050 is happy with a $380/ton tax on carbon dioxide, that’s equivalent to about a $1,400/ton tax on pure carbon. If you look over Nordhaus’ Table 5-4, you’ll see none of the proposals he studies are this draconian. The closest one is “Al Gore’s proposal,” which has an implicit carbon tax of $794.11 per ton of carbon in the year 2045. So we’ll just use Nordhaus’ analysis of “Al Gore’s proposal” (which Nordhaus takes to be an aggressive 90% emissions cut). If you look at Table 5-1 on page 82, you’ll see that the net effect of this proposal if implemented worldwide would be to make the world $21 trillion poorer compared to governments “doing nothing” to battle climate change. Specifically, Nordhaus’ computer model finds that the “Gore proposal” reduces climate change damages by about $12.5 trillion in present-value terms (compared to the “do-nothing” baseline), but that the carbon restrictions are incredibly destructive, reducing standard economic output by $33.9 trillion in present-value terms. Thus, on net, this policy causes way more harm than good, to the tune of more than $21 trillion in net damages. My point in walking through these numbers is to show just how absurdly high the carbon taxes are in Eberhard’s analysis; according to Nordhaus’ popular model, her high-end carbon tax rates would cause several dollars of economic damage for every dollar of avoided climate change damage. Unfortunately Eberhard seems to have no inkling that even if the standard computer models are correct, there is a point at which a carbon tax harms the economy more than even the potential “climate damages” it saves. Furthermore, once we factor in the shortcomings of these computer models—in this peer-reviewed article I provide a full critique of Nordhaus’ approach—we should be even more alarmed at the economic damage that people like Eberhard are prepared to unleash on the hapless residents of Washington State. To give one final frame of reference: This pro-carbon-tax website reassures readers that a $15/ton of CO2 carbon tax would only translate into about a 15-cent hike in gasoline prices per gallon. A more precise calculation shows that a $380/ton carbon tax—such as the one that Eberhard is fine with—would mean Washington motorists would pay about $3.40 more per gallon at the pump in the year 2050. Does this still sound like a no-brainer? If the mainstream economists who think a carbon tax will be set “optimally” are naïve, the handful of conservatives who favor it for supply-side reasons are truly delusional. As Eberhard and other progressives make perfectly clear, they have no intention of engaging in a “tax swap” deal. If they did, there would be no issue about the stream of revenue; the offset in other taxes would simply be adjusted. No, as Eberhard’s analysis drives home, progressives are licking their lips in anticipation of the “king’s ransom” in net receipts flowing from a new tax. Even in principle, the case for a carbon tax is dubious. Yet we don’t even need to get into the technical weeds. Even using conventional cost/benefit models that the Obama Administration itself endorses, it is obvious that the progressives clamoring for a carbon tax will in practice set it ridiculously high. Any potential environmental benefits will be swamped by damage to the economy. Furthermore, the government will get bigger as it spends the new revenue; it will not be used to offset other taxes and make the government leaner, as some foolishly claim.